Story: Skrækkelige Olfert is the terror of the town. He plays some mean jokes on the other kids, breaks windows with his slingshot, and is generally a menace. Equipment: Olfert usually carries a slingshot for breaking windows. Background notes: Skrækkelige Olfert (Horrible Olfert) started out as a comic in the magazine Hjemmet in 1958. Olfert would be the ultimate rude and obnoxious little kid, menacing both grown-ups and kids to the point where it could only be funny. Sort of like Garfield, only with a boy. 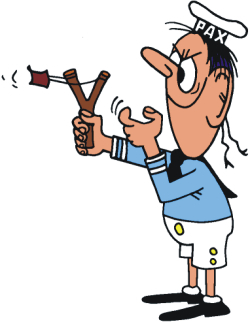 At the time Qvist shared a studio with cartoonists Franz Füchsel and Flemming Holbek, which had a strong influence both on Olfert's practical jokes and the characters (e.g. there is both a teacher and a reverend named Füchsel). The series ran in Hjemmet until 1972 and after a short hiatus it resurfaced in the newspaper Ekstrabladet in 1973. Here the series continued until Qvist died in 1983. After his death the series has continued as reprints. Skrækkelige Olfert made a short trip into the cartoon media. Holbek and Qvist made the cartoon Skrækkelige Olfert og søde Josefine for TV in 1966, but other than that the character has stayed a comic book character. The name Skrækkelige Olfert however has been transferred to other objects. Usually it is a nickname occasionally used for and by Danish guys who take pride in being rude and obnoxious. Also someone made a fly for fly fishing named Skrækkelige Olfert.